Saskatoon, SK - Saskatoon Blades forward Kirby Dach has been ranked #2 among all North American skaters in the midterm rankings released Monday morning by NHL Central Scouting Services. Dach, who turns 18 today, leads the Blades in scoring with 50 points in 43 games. The 6-foot-4 centre from Fort Saskatchewan, Alberta, is set to participate in the CHL/NHL Top Prospects game on Wednesday this week where he will serve as the captain of Team Orr. Kirby is the top ranked player in the CHL for the upcoming 2019 NHL Entry Draft. Dach was also named an alternate captain for the Blades for the remainder of the season following the departure of veteran Josh Paterson earlier in the month in a trade deadline deal with the Portland Winterhawks. Blades' rookie defenceman Emil Malysjev is also on the midterms rankings at #209 among North American skaters. Malysjev is in his first WHL season after being selected by the Blades in the 2018 CHL import draft. 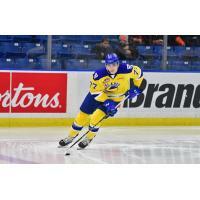 The 6-foot-3 Swedish defender has 2 goals and 14 points this season in 45 games played.